We are settling into a routine: breakfast then down to the beach for a swim, back to our place around 11:00. Not very many people here at 9:00.
there were lots of fish as usual. Kathy brought her camera today and may have some pictures to add. Around 2:30 we left for a walk, almost like yesterday but in the other direction. Saw some of the same things – turtles. This guy was headed back to the water, they are not what one would call frisky but as they say, slow and steady. 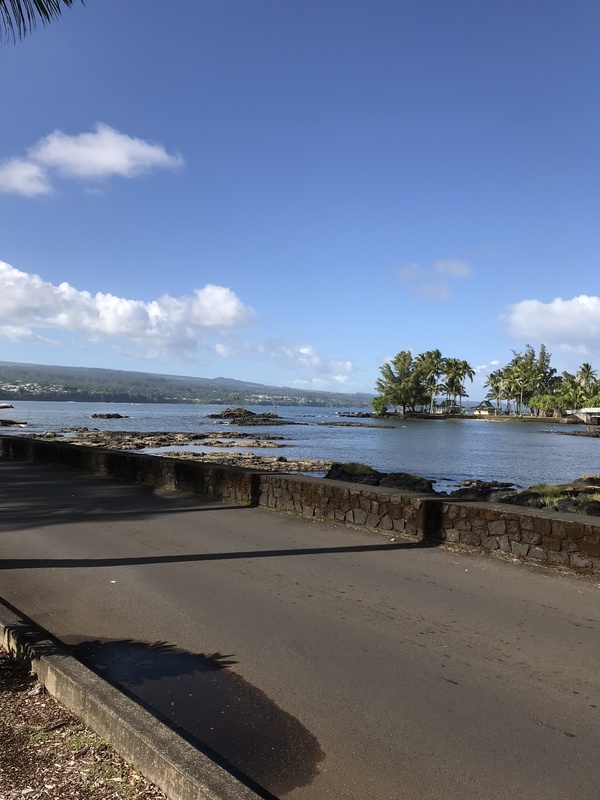 We carried on around the hotels along the beach, along beside the fish ponds and along a path that crosses a lava field. There some interesting formations like this lava tube. Ancient Hawaiians used them for shelters. There are quite a few feral cats on the island, they are usually very timid but this guy walked right by us like he was on a mission. Back to our place around 4:30, a good walk, and now for some lanai time. Beautiful morning here at our new place. Breakfast out on the lanai. 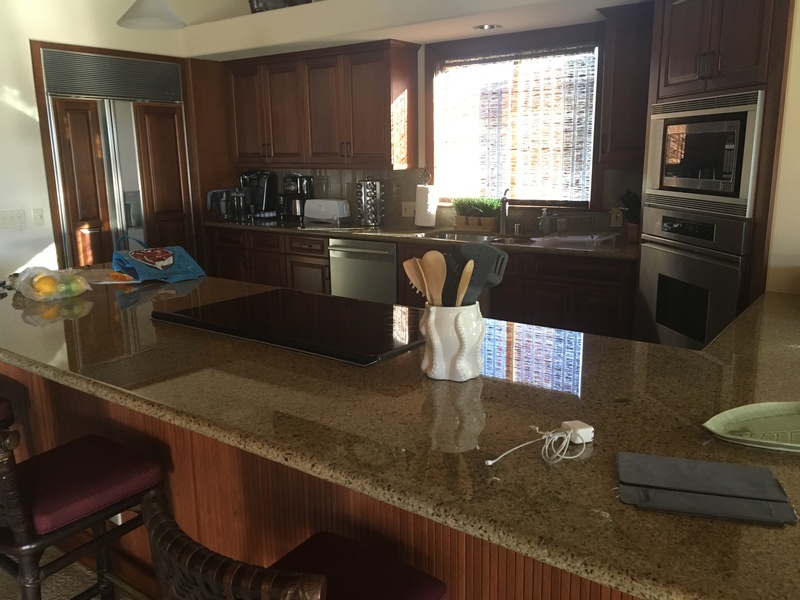 This is the outdoor kitchen part of the lanai. We’ve been looking forward to swimming in the ocean and after breakfast we drove a few minutes to the area called the “Beach Club” which is for people staying at Mauna Lani. It is a fairly protected little sandy beach. We put our masks and snorkels on and pretty well the first thing we saw was a turtle. We were able to swim along with it for a several minutes, it didn’t seem to mind the company. The water was a little murky but I did get some pictures. as well as a short video. We were in the water for a half hour or so, looking at the fish and enjoying the warm water. After stretching out in the sun for a while we headed back home at around 10:30. The resort area where we’re staying, Mauna Lani has 2 hotels, the Mauna Lani Bay and the Fairmont Orchid. A favorite walk for us is to walk a loop that takes us down to ther shore past the 2 hotels along the beach then back to our place. This is what we did this afternoon. We weren’t in a hurry and it took about 1 1/2 hours. Along the way we saw a herd of goats. They are fairly timid but cute. Close to the beach are some large ponds that are fed by freshwater underground streams. The ancient Hawaiians used these ponds to growing fish. There are lots of fish in these brackish waters. It was quite windy along the beach but lovely and warm. 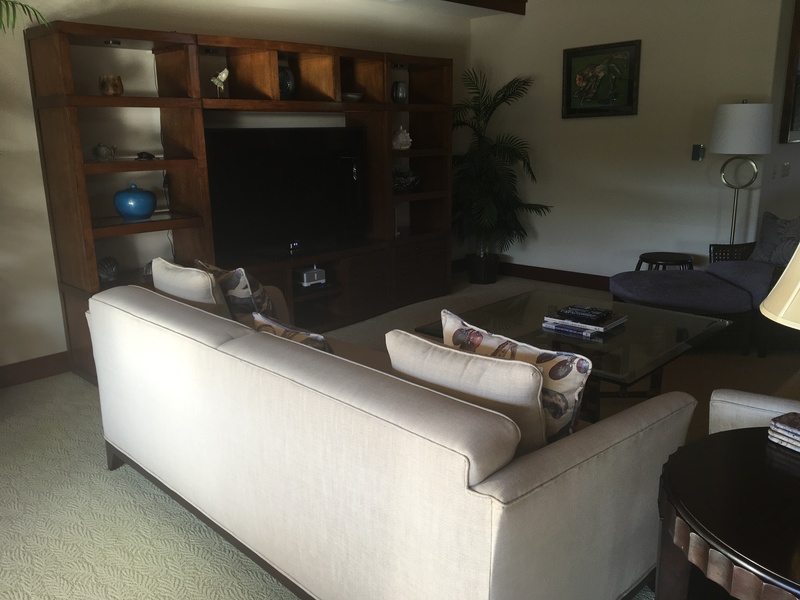 The Mauna Lani Bay Hotel has been closed for major renovations. It is supposed to re open in about a year. The staff was let go and the owners are hoping they will come back. It will be interesting to see because I’ve heard that Hawaii has the lowest unemployment rate in the U.S. The parts of the hotel that we’ve seen have been very nice, so after a reported $100 million reno it should be even farther out of my league. There was a nice rainbow up the coast just about where we were staying a few days ago. This has been turtle day! First while we were swimming and now walking along the beach. It is hard to resist taking pictures of them. We both have quite few. We have enjoyed seeing the Christmas tree at the Fairmont Orchid Hotel. It has varied but this year it is the same as last year. Behind the hotel there are 9 tennis courts. I think in dozens of times walking by them I have seen people using them twice. No sign that they are giving in to pickle ball yet. We’ve walked past this little structure quite a few times without going over to read about it. This is the road in Villages that our place is on. That’s it on the left. Nicely kept. After our walk we went over to the pool for a quick dip and a sit in the sun. We are on our way to Mauna Lani today after our one night in Hilo. We had breakfast in the restaurant and were treated to a nice rainbow from our view out the window. We could just barely hear the frogs during the night but not enough to keep us awake. Our after breakfast walk took us to the large Japanese garden right beside the hotel. then to little Coconut Island which is in front of the hotel. This island is called Moku Ola in Hawaiian which translates to “Island of Life.” Legend has it that you are feeling ill, swimming around the island 3 times would heal you. This coconut tree is marked with the heights of different tsunamis that have hit the area. Kathy is pointing to the highest one which hit in 1940, I think it said 26 ft high. Apparently this is one reason why old downtown Hilo has never been modernized; it will undoubtedly get hit again. Looking out the other way we could see a cruise ship in Hilo for the day. We left Hilo around noon and drove over the Saddle Road, a different route than we took getting to Hilo. It sort of cuts straight across the island rather than along the coast. We stopped for a bite to eat in Waikoloa Village at a Mexican food kiosk that we usually go to at least once. We were a bit early to get to our townhouse so we went for a walk along the shore at Waikoloa Beach. This is one of the bigger beaches on the island, it is called “A Bay”, short for a long Hawaiian name. We got to our new place around 4:00; were expecting it to be pretty nice and we were not disappointed. It is in the Villages at Mauna Lani. Here are the first few photos. At first glance it appears very well stocked even a dozen or so beers in the fridge. We left our place and moved to Hilo. This is a several hour drive with a few stops along the way. We stopped at Honoka’a where there is a fabric store that Kathy likes. We then stopped at the Hawaiian Vanilla Company, the only vanilla farm in the US. Before we left, Kathy said good bye to her little goat friends. Honoka’a is an old sugar town. Sugar growing along side the road. The Vanilla Company has a nice store. Just Shakin grows their own fruit for their smoothies. We stopprd at Rainbow Falls, a popular tourist spot close to Hilo. Hilo has a good farmers’ market everyday. Lots of paddlers along the waterfront. See the two little mongoose? This was our view for dinner. Mauna Kea is in the background. The annoying noise in this clip is caused by little frogs which were accidentally released on the island. Common in the Hilo area, they start after it gets dark and continue well into the night. The tree they are in is just outside our window. Another day with no big plans. After breakfast we went for a drive to the north end of the island, to the towns of Hawi and Kapa’au to the Pololu Valley lookout. This about a half hour drive and after about 10 miles it starts to get to less and less arid. We stopped at Keokea State Park along the way back. It was pretty windy and the water was very rough. There were showers for rinsing off after swimming but no one will be using them today. A Hawaiian fellow was fishing in the lee of a little breakwater. He didn’t have any luck that we saw. We stopped at a gallery in one of the towns and at a couple other parks with shore access. The coast is very rocky along this part of the island with no sand to speak of. Back to our place for lunch. After reading for a bit we decided to head down to the macadamia nut factory, which is a short drive from our house. It is a good place to go for a snack as they have free samples of nuts and coffee. after getting back we walked down the road to see some goats that we have noticed as we drove by. They were quite friendly, or maybe just hungry. There were a few birds, too We’ve got a checklist of things to do before we leave tomorrow, some we can do this evening, some we’ll do in the morning. It has been hard to predict what the sunset would be like but tonight turned out to be spectacular. Here are some photos, they don’t really do it justice. The sky was full of colour for at least 180 degrees. After breakfast we drove down the hill a couple of miles to Spencer Beach State Park and went for a walk along the shore. We came upon several little sandy beaches along the way. The place we’re staying is under the rainbow up on the hillside. After about 30 min. We came to this sign and had to turn around. Next to Spencers Beach Park there is a national historic site called Pu’ukohola Heiau. There are 2 big stone structures (Heiau) that were originally built by King Kamehameha in the late 1700’s. By building these, he was told that the gods would enable him to achieve his destiny and unify all the Hawaiian Islands. It worked out well for him in the end. On the way back we stopped in the very small community of Kawaihae and looked at Harbor Gallery, which has lots of incredible carvings. (No photos were taken) I did come away with some ideas. It’s not quite as windy so far today and once again it is sunny and warm. This is the view from my chair on the lanai looking south down the coast of the Big Island. Kathy was happy with the way her fabric turned out the other day and is doing some more pieces out back. It’s lunch time and it seems to me it will be easy to hang out here this afternoon.